Laure Genillard is pleased to present Exploding Utopia, a group exhibition which explores the contradictions, complexities and convolutions exposed through artist renderings of the ‘explosive’ and the deployment of explosive materials. The exhibition brings together a selection of international contemporary artists who have critically engaged with explosives and explosive powders in creating and conceiving work. The modern-day rupture between art and science is a post-Renaissance phenomenon, representative of the shift from theistic-based cosmologies to contemporary cosmologies founded upon scientific observation-based forms of knowledge creation. Today, it is those tenets and structures which result from the apparent reliability of the scientific method, however indeterminate, which are the modern yardstick of truth. The artist, in seeking to keep art relevant, embraces the aesthetic examination of all material, however seemingly ephemeral, unreal or unstable. Art becomes an ever-expanding frontier, matching, reflecting and anticipating apparent advances in scientific-technological development, posing a challenge to science’s near absolute authority over the jurisdiction of such materials, an authority whose overt physical control results in a less obvious code of systemic management over the interpretation and conceptualization of these materials and their resulting imperative to shape thought and culture. In his 1964 lecture “Chemical Revolution in Art” delivered at the Cambridge Arts Society, Gustav Metzger declared the artist’s absolute and unfettered right to use of materials, including those chemical, molecular and atomic. With this declaration, he laid down his utopic declaration -- We shall use science to destroy science. Exploding Utopia brings together a selection of artists who have engaged with the controversial and forbidden media of explosives and gunpowder in order to invoke, provoke and highlight the position of the artist as agitator, explorer, risk-taker and experimenter, performer and stakeholder whose strategies and interventions are capable of informing and reforming conceptual categories through a direct relationship with materiality. Michelangelo Antonioni’s 1970 classic Zabriskie Point sets the scene for an explosive encounter with the aestheticization of destruction, charged with the disturbingly hypnotic Pink Floyd track, "Come In Number 51, Your Time Is Up". On entering the exhibition, the viewer is received by Lawrence Weiner’s open-ended work, A RECTANGULAR FIELD CRATERING WITH A RECTANGLE IMPOSED 12 CHARGES EXPLODED SIMULTANEOUSLY, 1968. Well known for his ambiguous gestural texts, Weiner experimented with explosives in the early 1960s in the landscape of California to create craters as individual sculptures through which he explored his interest in the idea of ‘removal’ and the creation of sculpture through negation. His Cratering Piece from 1960 comprised a series of twelve explosions set to ignite simultaneously in four corners of a field in Marin County, California, (apparently causing him to be fined twenty dollars). These explosive action pieces, created before the artist formulated his “Declaration of Intent” 1968, were aesthetic exercises in removal in order to create sculpture (in this case both violent and process-driven). The cratering pieces are echoed in Weiner’s simple yet provocative statement set out in the main gallery while the artist’s restatement of this work as language removes yet another layer - that of the physical space sculpture invariably occupies. Cornelia Parker is well known for her transformations of matter through violent and chemical means to create psychologically and spiritually provocative installations. Exploding Utopia presents work from Parker’s unexpectedly subtle ‘spent match’ photogram series. The photograms, created by laying spent matches on photographic paper and then exposing them with a live match, anticipate the many oppositions reflected throughout the exhibition and form a poetic reminder of the essential illuminator for the surrounding works – ‘A single spark can start a prairie fire.’ This transformational potential is echoed in Fiona Banner’s seldom displayed 1997 sculpture, The Works, a cardboard packing box containing a mixture of both self-made and carefully chosen fireworks. When a single fuse is ignited, the pyrotechnic elements explode in a carefully choreographed sequence lasting four minutes and twenty five seconds. The box is accompanied by a printed play list which notates this action. In this exhibition, The Works will remain unexploded, in its pure state of potentiality, providing a philosophical counterpoint to the extraordinary 1987 Fischli and Weiss film, Der Lauf Der Dinge -- The Way Things Go, also on view in the main gallery. Juxtaposing The Works is Mariele Neudecker’s Psychopomp. On her visits, during a three month residency at the ‘Headlands Centre for the Arts’ in 2010, to the historic and restored Nike Missile Site in California, Neudecker came across six specimens of the now obsolete Hercules Missile, an awesome twelve and half meter behemoth designed to intercept the Soviet ballistic missiles developed in the 1950s and 60s. Gaining permission to work on the subterranean site, Neudecker created her twin monolithic graphite rubbings of the missiles, one authentic, the other a decoy. The installation, reproduced to scale, lies partially exposed, fan-folded on continuous stationary; both a nod to Conceptual Art practices which grew out of the Cold War period and a tacit reminder of the hidden yet unassailable interconnectedness between computer and military technologies. Descending the stairs, the visitor’s experience moves from the state of potentiality to one of actualisation. The lower gallery showcases the work of Werner Schreib, Tim Burns and Enrico Gaido together with documentation and film footage of the realised events of Ivor Davies, Paul Burwell and The Bow Gamelan. 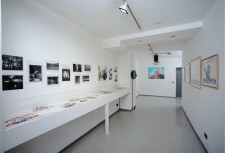 The gallery will also premier William Raban’s thrilling and never before exhibited 1997 film, Rights of Passage, featuring musician and percussionist Paul Burwell, together with excerpts from Raban’s documentation of Stephen Cripps’ performance at the ACME gallery, Covent Garden in June, 1981. Burwell collaborated with the pyrotechnic composer and percussionist, Stephen Cripps, to create works which exploited the chance encounter of percussive sound with explosives and gunpowder before going on to co-found The Bow Gamelan with Anne Bean and Richard Wilson. The exhibition showcases for the first time in Britain the explosion drawings of German artist Werner Schreib who trained as an explosives expert in the German military. Under the influence of Max Ernst, he developed a style he coined ‘semantic painting’, declaring destruction to be a form of poetic transformation and stamping his works with the phrase “destruction et transformation poétique”. In the 1960s he began to create works which directly challenged and destroyed the pictorial medium through the use of explosives, gunpowder and fire. A follower of the ideas of the surrealist poetry of Comte de Lautréamont, he viewed destruction as a legitimate means of design. He made numerous fire sculptures and "Pyrogravuren" inserting powder and fuses into his paintings, most notoriously igniting an image of German Chancellor Ludwig Erhard in a ‘happening’ at the London Free school playground during the 1966 Destruction in Arts Symposium. Welsh artist Ivor Davies was co-organiser of the 1966 Destruction in Arts Symposium. Davies had training as an explosives technician. He fearlessly choreographed performances in which explosives were central. The exhibition features archival photographs and related materials from the artist’s first DIAS-inspired performance, Prelude to Anatomic Explosions, held at the Army Drill Hall in Edinburgh in September 1966, alongside the film footage, scores and other never before exhibited archival material from The Bow Gamelan pyrotechnic sound sculptures of the 1980s. 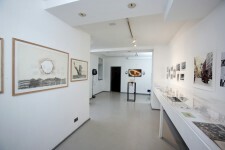 On display is also documentation from the work of American artist James Acord, a licensed handler of nuclear materials, who struggled during his lifetime to realise his vision, creating art by extracting minute amounts of uranium from his collection of Fiesta Red tableware and researching the secrets of nuclear fission. The exhibition includes the British debut of Italian artist Enrico Gaido whose building-engineering inspired practice focuses on the examination of accidents as something which interrupts the chain of randomness typical of our daily life: a life that otherwise might appear uninteresting. Employing pyrotechnics and engineering principles, the artist creates installations that realise and reflect the performative aspect of ‘event’, as a concrete image, animated within an element of time, while also being consumed by it. Gaido is interested in ideas of time, and the ‘event’ as a microcosm of the whole. Gaido will perform for the first time in Britain his new work, Freezing Utopia, in which the artist initiates a series of micro explosions within a gelatin base, capturing the instant of collapse and retaining the imprint or trace of the explosion. Australian artist Tim Burns has, since the 1960s, employed explosives together with film, video, installation and performance, to create situations which critically reflect on what Lucas Ihlein describes as “our hypermediated, industrialised western society”. Burns eschews the studio and instead creates live performance pieces and subversive interventions in the public sphere to initiate unexpected perceptual shifts and dislocations in the expectations of the viewer-participant. His provocative 1980 film, Against the Grain: More Meat than Wheat, will be on show in the lower gallery. Inspired by the real life actions of groups such as the Baader-Meinhof Gang, the film is a fictional reflection on the motivations of an artist who takes to direct action by planting a bomb in a wreath delivered to a cenotaph during an ANZAC Day parade. Burns has constructed a montage which explores the connection between art and life, and the artist and direct action, interposing sampled source material from the Australian Broadcasting Corporation with ‘fictional’ archival footage, resulting in a form of ‘reverse appropriation’ where didactics disappears into ambiguous irony. Exploding Utopia invokes a vision of the artist as a dynamic protagonist whose contribution to knowledge-creation and ways-of knowing is crucial. 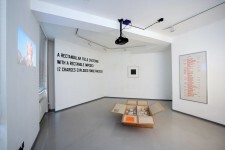 By engaging aesthetically with the stuff of destruction – sodium nitrate, potassium nitrate, saltpeter, black powder, nitro-glycerine, dynamite, and other explosive materials, each of the artists featured in the exhibition has produced works which inhabit unstable realities, embrace ambiguity and uncover new possibilities. Here the studio becomes reinvented as a laboratory of the future, the space of the studio is transformed into the space of the world and the artist realises his or her identity as one who challenges and reinvents the prescriptive canon of culture. The artist Enrico Gaido will perform microexplosions in a new work entitled ‘Freezing Utopia’ at 8pm during the opening, on Friday 27 Sep. Originally from Victoria, Canada, Rozemin Keshvani has re-located to London where she is an independent curator. She holds a Masters in History of Art and Modern and Contemporary Art from the University of Glasgow and Christies Education, London, as well as degrees in Law and in Philosophy. She has developed an archival and research based practice, which emphasises her interest in time based, conceptual and transformatory contemporary art practices and has made special study of the work and writings of Gustav Metzger, John Latham and Stephen Willats. She will be delivering a paper at the Henry Moore Institute Conference, ‘Pyrotechnic Sculpture’ in November. Her most recent exhibition, ‘Better Books: Art, Anarchy and Apostasy’ which featured work from artists Bruce Lacey, John Latham, Gustav Metzger and Jeff Nuttall, among others, showcased in London at Flat Time House last year and toured to ZKM Karlsruhe Museum of Modern and Contemporary Art in 2012-2013. The exhibition will re-open at the Trondheim Kunstmuseum in February 2014. She currently manages the archive of the late Pip Benveniste and is working on a retrospective of the artist’s work. ENRICO GAIDO | ‘FREEZING UTOPIA’ from Laure Gennilard on Vimeo. 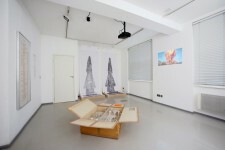 ENRICO GAIDO/TIM BURNS IN CONVERSATION with curator Rozemin Keshvani and Laure Genillard from Laure Gennilard on Vimeo.